Will your company be hiring? Does you company have any internship, co-op or career opportunities that you will be hiring for? We are putting together a list of opportunities that will be available to high school and college students. As an AWT member you have the benefit of submitting news from your company to be published in The Manufacturing Minute! Is your company interested in hosting a student tour? We have over 1,000 students interested in touring an AWT company, we need your help to schedule these tours. If your hiring and would like our help, we have a database of resumes available to you! Please send the description of the positions you are hiring for and I will screen through our database to see if we have anyone that will match your need. CLEVELAND, Ohio -- On the shop floor at Astro Manufacturing & Design last week, David Slamic guided an electrode wire across a slim, smoldering block of steel, shaping a precision part that will go into a surgical device for the Cleveland Clinic. Then he wiped his hands on an oily rag and beamed like a toymaker. To have the President more than double mentions of manufacturing than has been said in the last 11 years, means our message has reached the top of government. This is the most important speech any politician delivers each year, with an estimated 50 million viewers and lays out the President’s priorities for the year, which clearly includes manufacturing. The Waukesha County Business Alliance said Wednesday that it has selected Scheibel Halaska as the agency to design and implement Wisconsin's "Dream it. Do it." manufacturing career-building initiative. "Dream it. Do it." is a national recruitment strategy sponsored by the National Association of Manufacturers. "The campaign is designed to re-brand the manufacturing industry as an industry providing high-paying, high-quality careers," the WCBA said in an emailed statement.The campaign is targeted at young people ages 17 to 27. Wisconsin will be the 20th region nationally to implement the program after a statewide license was secured by the Wisconsin Technical College System.Manufacturers in the state have repeatedly said that finding qualified workers with the skills needed to operate complex, computer-controlled machinery is the top business challenge they face. The initiative will first be implemented in the Milwaukee 7 economic development region, with the WCBA leading the program. Eventually, the program will be unveiled statewide. "The region will serve as a successful foundation for a statewide adoption in subsequent phases of the initiative," according to the statement.The program will begin with the development and launch of a careers website. "A foundational element of the website will be tools and resources to support area manufacturers in becoming better at attracting, retaining and engaging next generation workers," according to the statement.The Waukesha County Business Alliance is a countywide chamber of commerce with over 900 member companies, representing more than 60,000 employees. We have a cultural memory of the days when factories employed thousands of relatively low-skilled workers and provided them with relatively high wages. But these are not those days, and the recession has put them further behind us because, to survive, companies must increase their efficiencies. A former customer service representative, Dus Gray, 33, lacked mechanical skills when he came to Astro Manufacturing four years ago. But an aptitude for math helps him to program and run computer driven lathes. He's polishing a piston liner for a torpedo. Many of the area’s largest manufacturers were on hand at the annual meeting for the Alliance for Working Together at Lakeland Community College’s Holden University Center. 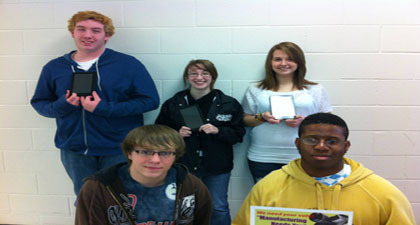 Congratulations to the AWT "Manufacturing Needs You"Student Video Contest Winners! Thank you to the participating companies, schools and parents involved in making this contest such a success. We are looking forward to next years competition! Please Welcome New AWT Member Criterion Tool & Die, Inc. Experience Criterion's... "Vision Of Excellence!" Criterion is a precision machine shop that specializes in CNC Milling, Turning and Swiss Turning to tolerances of +/- .0002. Providing our partners in the medical, aerospace, electronic and commercial industries with quality precision components in prototype through production quantities. Over 132 years of combined technical experience in precision-machining gives Criterion's machinists the ability to solve your most demanding machining requirements. Local Whiz Kid: David Schellenberg uses the AWT RoboBot competition to confirm his dream of pursuing a career in engineering! The Alliance for Working Together's RoboBots is a competition designed to spark an interest in engineering and manufacturing among participating students. Teams build robots and are given the materials they need to do so. Each team is also provided a kit to get them started and free use of nearby manufacturing facilities that participate in the tournament to build the robot. This presentation is tailored to address and strengthen the "weak links" in the mill operations in regard to proper tube and pipe mill set up. Problems and Solutions will be outlined throughout the presentation in the major sections of forming, welding and sizing sections. US Endoscopy has announced the full-market release of its Torrent irrigation tubing system. The Torrent tubing, a trademarked product, is a two-part system consisting of 24-hour irrigation tubing and a single-use endoscope connector. The irrigation tubing is used in conjunction with an electric water pump and endoscope to provide irrigation during gastrointestinal endoscopic procedures. The disposable Torrent tubing and single-use scope connector protect patients from potential cross-contamination. US Endoscopy, based in Mentor, designs and manufactures endoscopy devices for the U.S. and international markets. AWT Student Tours Are Making An Impact! Recently a student group visited Astro Manufacturing for a company tour and lunch with Rich Peterson. Thank you Rich for continuing to take great strides in promoting careers in manufacturing to our future workforce. Attached is the response Rich received from the participating school! Copyright (C) 2019 Lakeland Community College. All rights reserved.